A delicate nectar made from honeysuckle flowers and infused with sweet ginger syrup, pureed mango and honey. That was the intention anyway! Based on Mixers Club feedback I think I need to change my description. This is a ginger-mango candy. I will eventually tweak it a bit to bring it more in line with that profile, but it's tasty enough to be shared and mixed by other ginger fans out there as is. I first combined ginger and mango together for an entry in the Mixer's Club sub-Reddit when our theme was "non-representational mixing". I loved the combination but felt the recipe lacked a solid foundation. The syrupy sweet combo wanted to be a nectar. I probably could have fine tuned the recipe a little and called it a nectar in the way extra sweet fruit juices are sometimes called nectars. But the very next month our theme was to improve a recipe from the past year. This provided me an opportunity to combine these flavors into a true nectar, as in the yummy sweet liquid that hummingbirds get from flowers. Honeysuckle was the obvious choice for the heart of our nectar. It's light and sweet and not perfumey. Plus it does magical things when combined with FLV Ginger. It does an excellent job of carrying our top notes and sitting quietly in the mix while whispering, "I'm here." HS Ginger is where the syrupy sweet ginger note is coming from. If there is a star in this recipe, this is it. The FLV Ginger gives it some support. It is more floral than spice though. 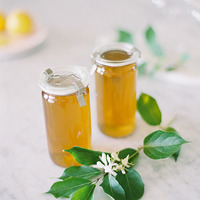 When combined with honeysuckle it creates a flavor that is very much like a gourmet honey such as wildflower or orange blossom honey. I can almost see using this concentrate as a sweetener for more exotic flavors. The mango was the most difficult part of this to get just right. I tried about 15 different combinations of mangoes with varying percentages during the two months I worked on this. Honestly I am still not convinced it's perfect. The Sweet Mango was in every version I tried. By itself it sits too far in the back though, and the mango is more of an afterthought than a main note. Other mangos were too "clean" or brought a peel note with them that wasn't working with the ginger. FLV Mango is very creamy. It would make an excellent smoothie flavor. I didn't like it at first and almost went back to HS. But I kept vaping it and tweaking percentages and it grew on me. I was tempted to push the overall percentage of mangoes a little higher but, surprisingly, ginger is easily bullied if you are not careful. I wanted the ginger as a main note rather than an accent but I also wanted that for the mango. So it was a delicate balancing act and the current recipe is what I finally decided on. The FA Honey is there for extra sweetness and to push the honey note created by the Honeysuckle/FLV Ginger combo. I was tempted to go a little higher with it, but I have heard the honey horror stories so I never even attempted a version with a higher percentage. INW Cactus adds juiciness. It is actually sweeter without the Cactus, which is weird because I know it usually sweetens too. But apparently when you are working with a more syrupy profile this is not the case. I think it brings a touch of a green note with it. At 0.5% it doesn't interfere with the rest of the profile though. Feel free to leave it out if you are not a fan. Give this about 3 days for the cactus to settle down and the ginger to come up. This recipe is the property of Loonicorn and released under the CC Attribution-NonCommercial-NoDerivatives 4.0 license. You may not copy, derive or commercialize this recipe without following the terms of this license or the explicit permission of the creator. Super enjoyable! It tastes a lot like what I remember Chimes ginger-mango candy tasting like. It's mouthwatering just like them, too. The ginger is definitely not a ginger ale type, a dry powdered ginger, or a fresh ginger, it's a lot more like Gin Gins or other ginger candies, which makes for a great vape. It also seems to be obliterating everything I don't like about CAP Sweet Mango, which some help from the FLV Mango and the Honeysuckle, but mostly it's the ginger doing that. It seems like an important discovery, learning that a little ginger can clean up that horribly overripe mango. I like how CAP Sweet Mango rides lower in the recipe instead of just sitting on top and pulls FLV down with it. Cactus of course helps make it juicy and fortunately I get that but don't get any of the Cactus taste, so that was clearly used here with great success here. I did not get much discrete honeysuckle flavor from it. I'm sure it wouldn't be the same or as good without it, but it seems to get overwhelmed by the sweet and syrupy ginger and mango. I do get a bit of honey but it still seems more like one of those candy chews than a "nectar." Which isn't a problem for me at all, I love those things. I almost took it down to 4 stars for being called nectar and not really seeming nectarty, and the honey drizzle on top actually seeming out of place with everything else, but it's just so darn tasty and that mango + ginger thing worked terrifically. 4.5 stars?